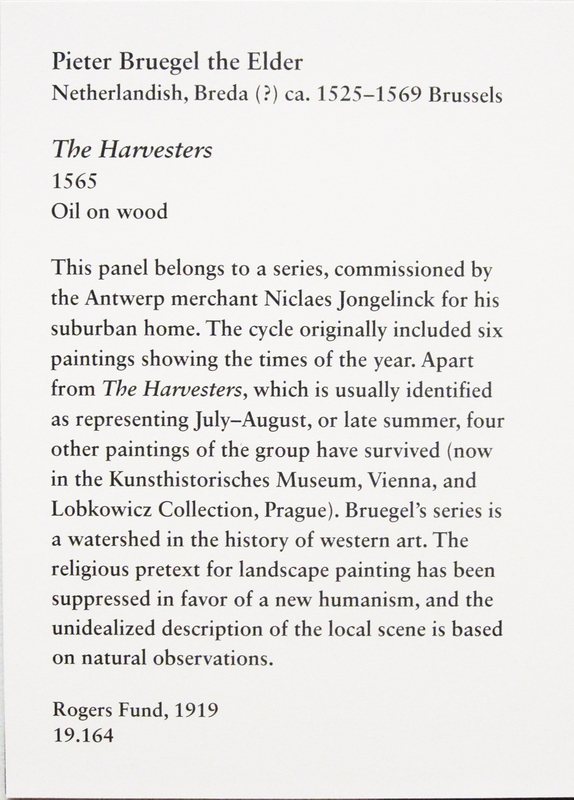 I remember The Harvesters by Peter Bruegel from a projected slide in the first-year art history class I took decades ago. 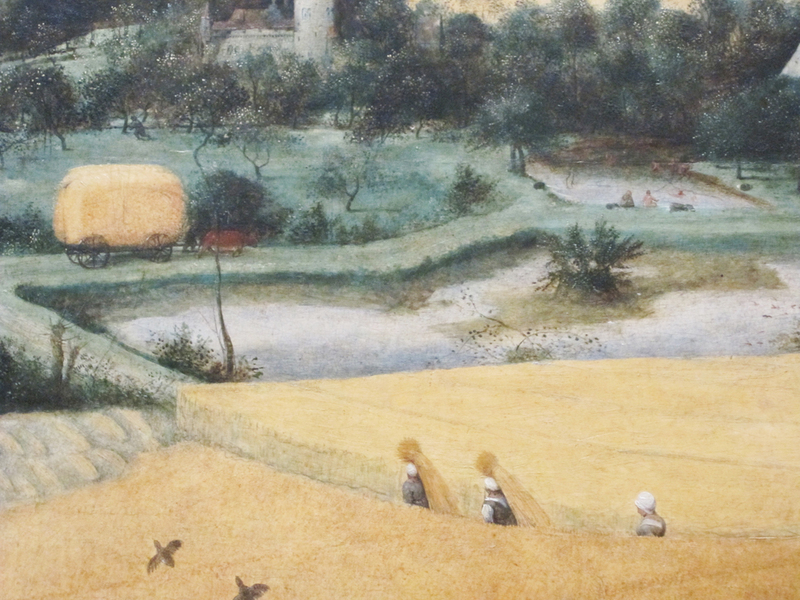 Recently I viewed the original again at the Metropolitan Museum in New york. 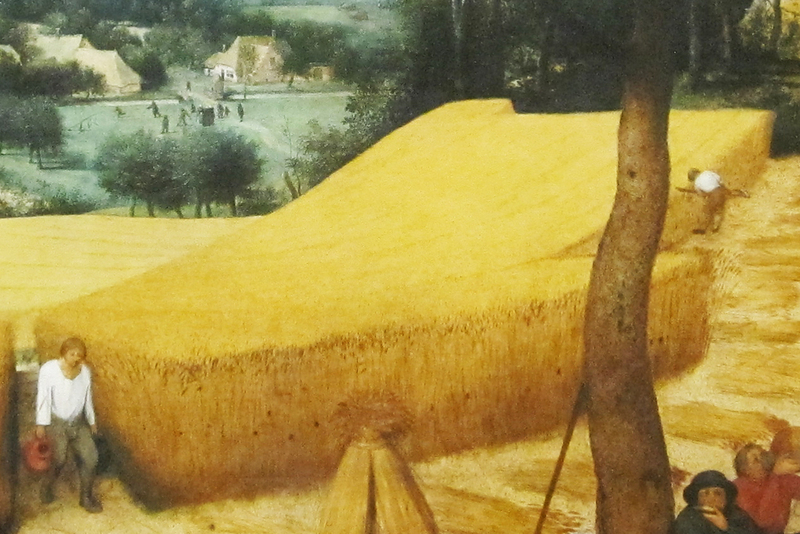 It is an impressive, important painting, about four by five feet in size. 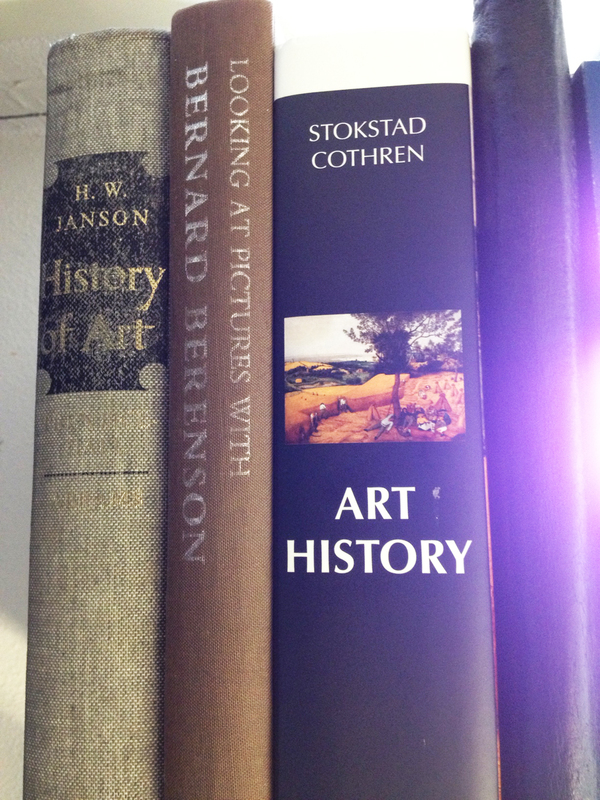 What I remember from the original art history lecture was how, even that long ago, artists liked big abstract shapes. But when I saw it this time, I finally looked past that big shape to see marvelous little things. 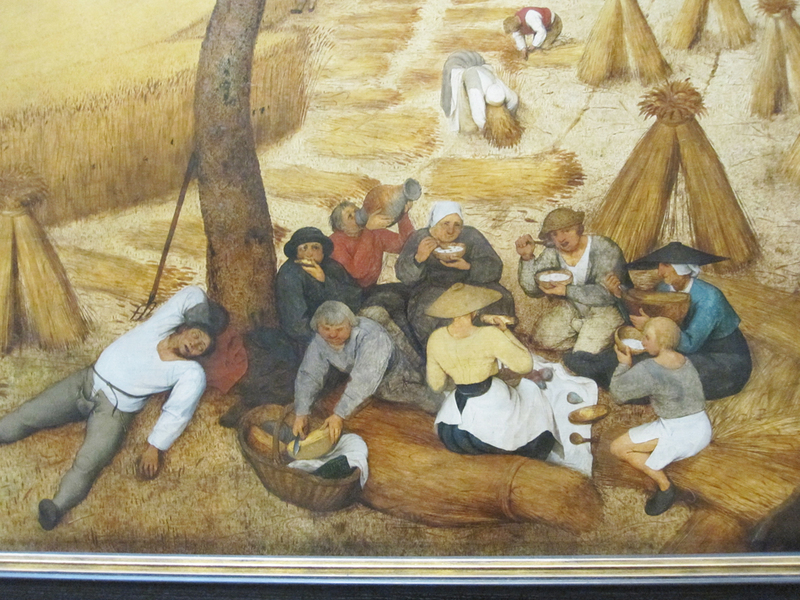 Of course we see the group having lunch, one guy snoozing. 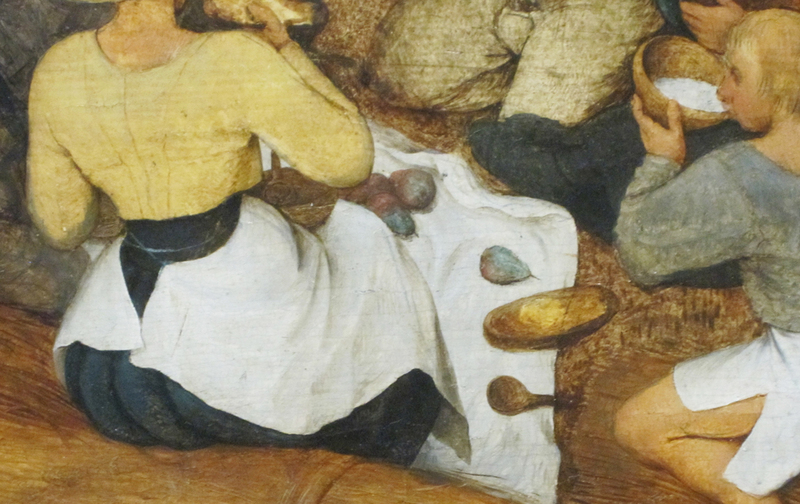 But check out this little detail of pears, dish, spoon. 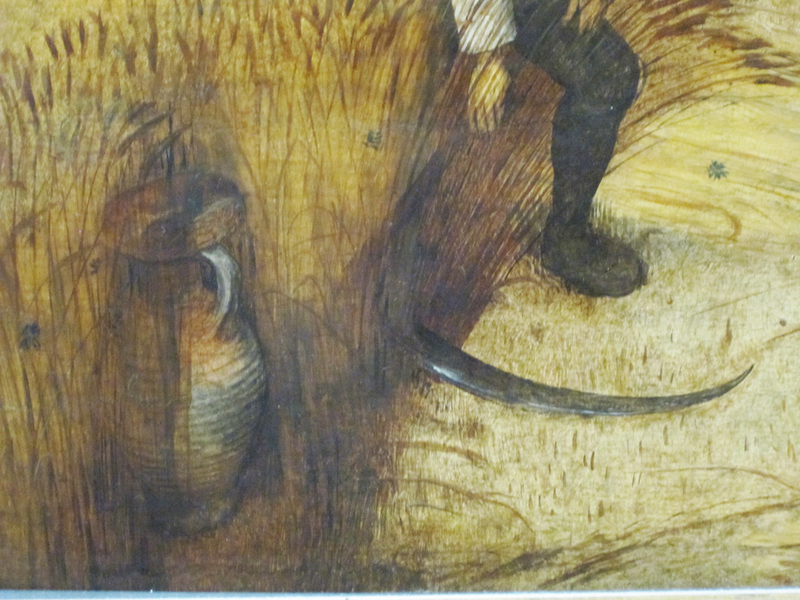 Another intriguing detail, a jug, just inside the edge of the uncut wheat. Maybe compositionally necessary. And the folks carrying sheaves up the road, an ox drawn wagon further along. 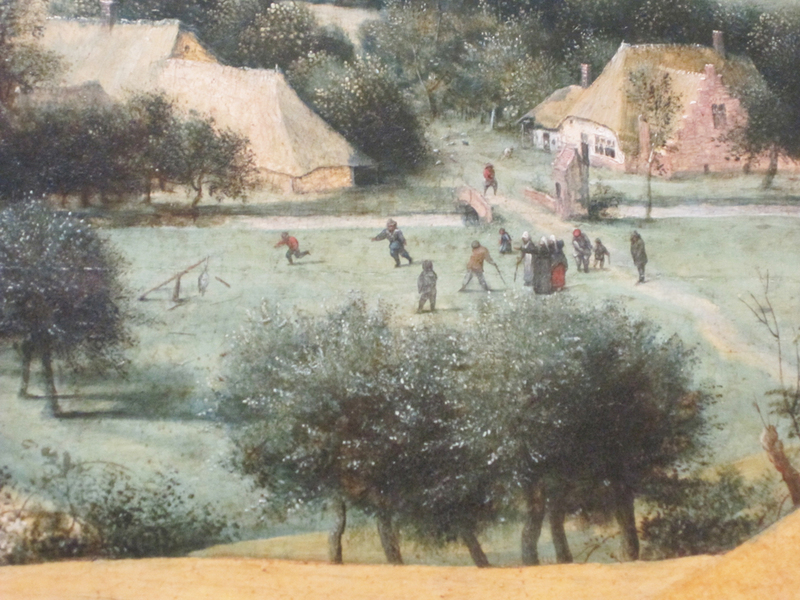 Further in the distance, folks seem to be playing some kind of game, and there are spectators. The details of the houses are pretty cool. 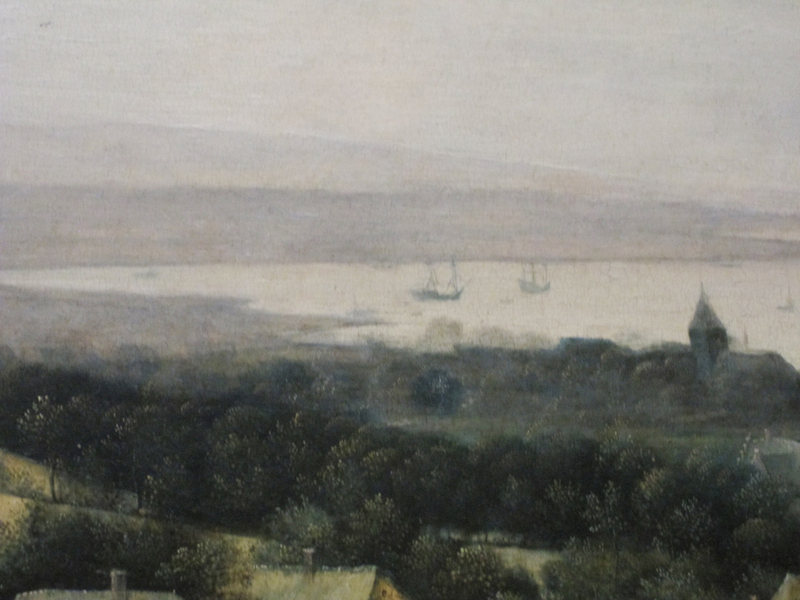 And far off, a couple ships on the water. 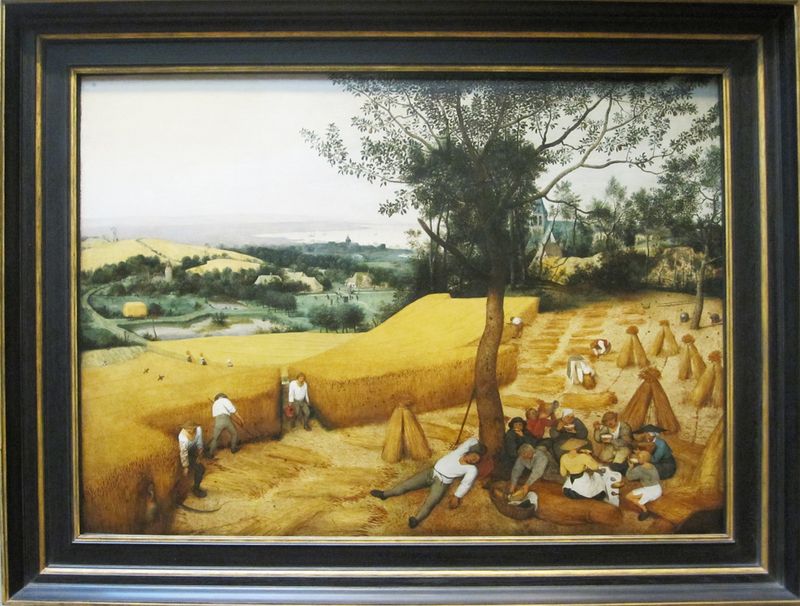 Bruegel tells quite a story in this picture, not just the harvest, but something about the happenings of the day beyond the scything of wheat. 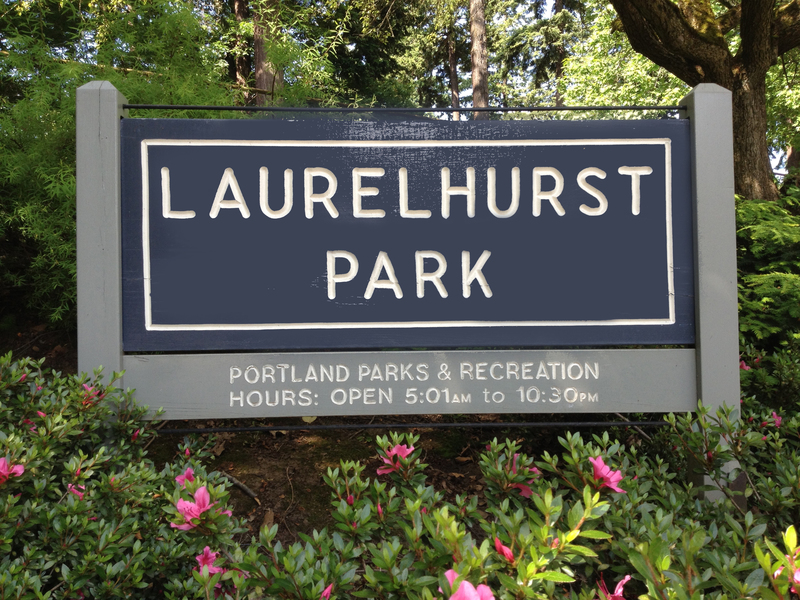 Recently I was on my way to play volleyball in Laurelhurst Park when I came upon this park sign with a bit of spray painted vandalism. It reminded me of something that’s bugged me for awhile. 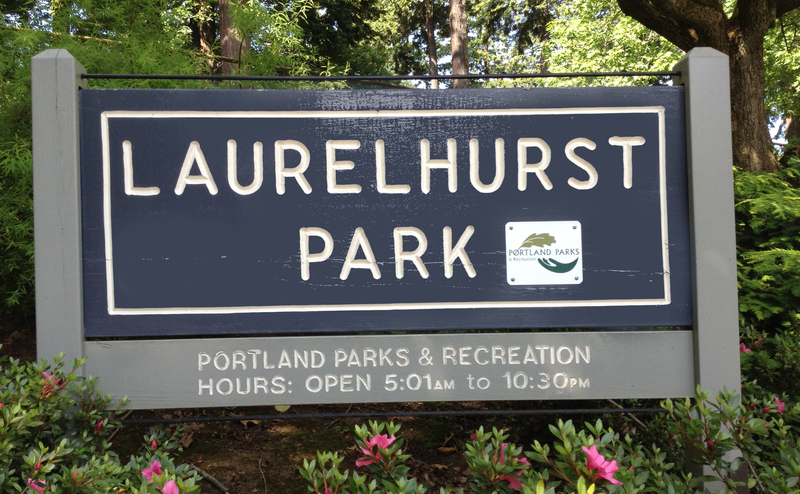 As I recall the background used to be a forest green, but this color seems OK. What bothered me was when some idiot in the Parks Department decided that since they got a new logo, they needed to post it everywhere, including screwing up the design of these signs. 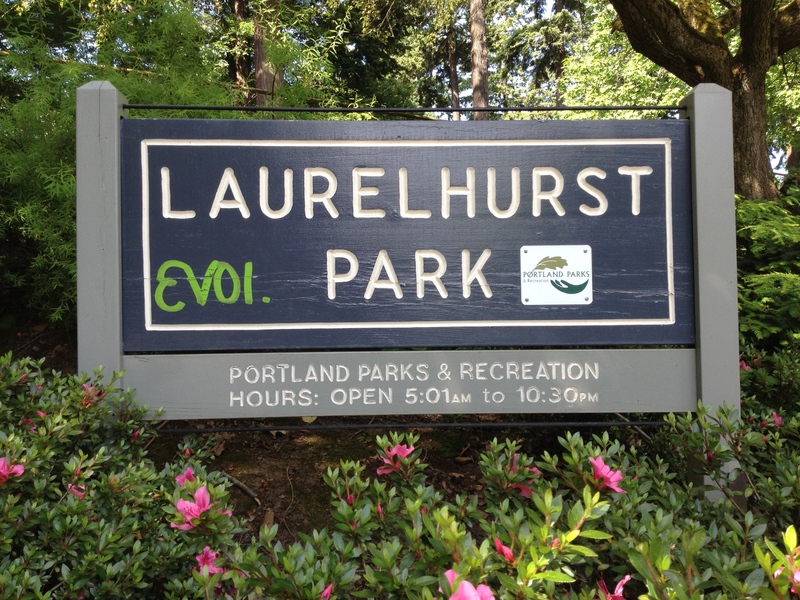 But maybe the parks logo tag is worse, since it won’t get painted out. 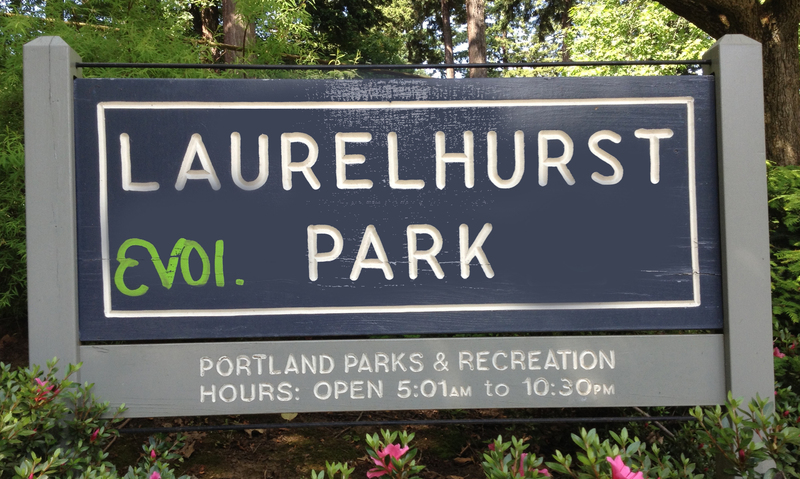 See my post of January 27, 2013 for other institutional vandalism.